I crocheted my first hat! It was really not as difficult as I thought it would be. 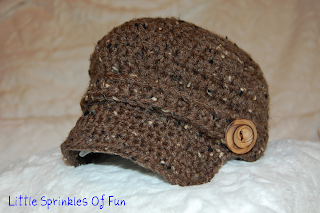 I added a crocheted strip and buttons to the front of the hat to make it into a hat for a boy. I found the pattern here! I made this hat to give as a baby gift to our Music teacher. She should be having a baby boy anytime now! She loved it! It made the cutest/sweetest little baby gift! That's so cute! I want one for myself! What a beautifully done little hat! What a lucky little baby! I really like your blog - I'm trying to get mine off the ground and was wondering if you could come check it out and consider following. Really cute, I love the button! Love the hat. Super cute! SO CUTE! Love love love. What an adorable hat. Thank you so much for linking up to More The Merrier Monday. I can't wait to see what you come up with next week. love the hat, my sister in law is due to have a baby in July so may have to give this a go!! WOW! This is an awesome hat! Wish I knew how to crochet! 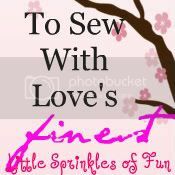 I'd love if you would link up this project at Sew Woodsy for What's Up Wednesday's link party. You made this? I love it - you should sale them - I would buy a few! Love it! I haven't crochet anything since I was a pre-teen. I don't know if I even still know how. You are the sweetest. Now... if only he would show his sweet face so we could cuddle him! This is so great!!! What a great baby gift! Great job! It's so cute! I've never learned how to crochet and am so jealous! Thank you so much for linking this up! Oh.my.gosh! That hat is adorable!! Absolutely love it! Literally just made this in less than 3 hours. I just have to weave in the ends and sew on the band and buttons. I didn't see instructions for the band either so I just chained 25, ch 3 (for dc), skip 3, dc across, sl to close. Hope that helps anyone else who's wondering. what type of yarn did u use to get the "slubbed" texture? I believe this was a lion brand yarn. Is this the same as pattern as the Cheri Hat? I can't find the page boy hat pattern. Can anyone direct me in the right direction? THanks! Yes, it is the Cheri Hat pattern. I just double crocheted a strip in the length of the hat to add a more boyish feature. I hope that helps! How could I modify this pattern for an adult (w/a small head)? 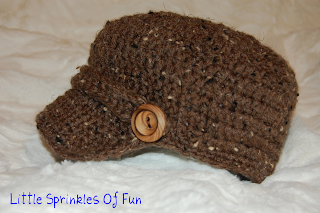 link to the Crocheted Newsboy Hat doesn't work for me...really wanted to make it in camo for my grandson...pls if u can send me the pattern at gates67@hotmail.com...ty so much! !